She is no ordinary ship – she is the world’s first all-suite, all-balcony luxury liner. You will find your perfect private retreat among her 350 suites and enjoy impeccable service from her 445 professional and friendly crew dedicated to fulfilling your wishes. Seven Seas Mariner exudes comfortable sophistication throughout her public spaces where you can take in the ever-changing vistas. Guests enjoy 180-degree sea views from the curved bar and plush seating of the Observation Lounge and the Horizon Lounge boasts floor-to-ceiling windows with a comfortable outdoor deck for an aft view. Best of all, guests choose from four exquisite dining options, including the premier steakhouse Prime 7 and the classic French restaurant Signatures. 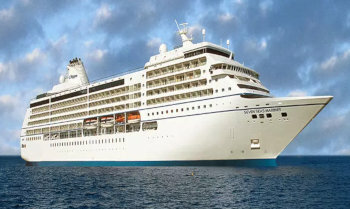 View all Seven Seas Mariner cruises or view more options for Regent Seven Seas cruises. Located on Deck 6 mid-ship, guests enjoy complimentary coffee drinks prepared by our baristas, as well as delicious pastries, gourmet sandwiches and homemade cookies. Additionally, international newspapers and news magazines are made available. This venue is the perfect destination to relax, converse and enjoy coffee and snacks throughout the day. This is the perfect setting to enjoy breakfast, lunch and dinner. Located on Deck 5, Compass Rose delights with a beautifully defined atmosphere and transitions from refreshing natural light during the day to an elegant theme at night. The new dinner menu is so encompassing and customizable that it provides guests with a seemingly endless combination of dishes to choose from such as meat, fish and seafood items, prepared to taste, garnished with a sauce of choice and complemented with side dishes and accompaniments. Additionally, each evening the ship’s Executive Chef creates nightly specials, which adds more than a dozen mouthwatering appetizers, pasta dishes and entree choices to the menu. Located on Deck 11 aft, guests take in stunning ocean views while enjoying elegant breakfast and lunch buffets in the chic indoor dining room or al fresco on the shaded, open-air deck. Breakfasts include traditional favorites, as well as a made-to-order omelet station, a variety of fresh fruits and pastries, along with daily specials, like fluffy Belgian waffles with fresh blueberry compote. For lunch guests indulge in an array of choices from a bountiful salad bar, gourmet sandwiches, hot carving stations and delicious desserts. Located on Deck 11, the Pool Grill is open-air, yet abundantly shaded for comfortable dining. Choose your preferred table and one of our attentive staff will take your order. While the atmosphere is deliciously informal, the menu and preparation reflects the same attention to detail as the finest of restaurants. Enjoy grilled-to-order burgers, grilled seafood, sandwiches and fresh salads. Guests enjoy milk shakes, malts, and hand-dipped ice cream desserts sprinkled with all their favorite toppings. A true classic in every sense, Prime 7 sets a new standard in steakhouse fare with its contemporary interpretation of an American favorite. Located on Deck 5, the restaurant is handsomely decorated with supple leather wing-back chairs, burnished woods and rich earth-toned fabrics, Prime 7 exudes a distinct, intimate elegance. This is glamour redefined, a luxurious setting to enjoy classic steakhouse cuisine with a modern flair. Preparing authentic, decadent French cuisine is an art form and is the raison d’etre of our French restaurant, Signatures. Capturing the diversity of French fare, our seasoned chefs offer an exquisite dining experience with tantalizing tastes and enticing presentation. Consequently, each and every dish served in Signatures is absolutely sublime and purely French. Signatures is located on Deck 6 aft and is open for dinner each evening, reservations are required. The beautifully decorated Card & Conference Room is an inviting and tranquil oasis. Guests may gather their favorite teammates for lively afternoon or evening of board games, as well as enjoy a social game of Bridge or participate in an ACBL Tournament on select voyages. The Card & Conference Room is located on Deck 6 next to the Coffee Connection. Located on Deck 5 in the Atrium, Destination Services helps guests arrange shore excursions, whether a tour from our FREE Unlimited Shore Excursion menu or a customizable Regent Choice Shore Excursion. The helpful office staff can also assist with tailor-made pre-and post-cruise programs, from a simple stay in a luxurious hotel to a 3-night extension that includes private tours of coveted destinations. Well-stocked and exceedingly comfortable, the Library offers a calm setting for reading and relaxing. A vast collection of volumes ranging from destination-specific guide books to best-selling mysteries to classic literature are available. The Library is conveniently located next to Coffee Connection on Deck 6. Located on Deck 11 outside area by the pool, guests can enjoy refreshing cocktails and frozen drinks expertly prepared by our Mixologists in the relaxed atmosphere of the Pool Deck. Guests lounge their day away under the warm sun and an unforgettable vista on our Deck 11 Pool Deck. Outfitted in teak accents, the Pool Deck is one of the most elegant at sea, featuring a lavish pool and two whirlpools. Amiable and dedicated crew is readily standing by to bring refreshing beverages and plush towels. For those in the gaming mood, a few pulls at the slot machine or hands of blackjack in our elegantly appointed Casino are the perfect draw. The Casino is located on Deck 4, and is open every day at sea when not restricted by territorial border limits. Blackjack, roulette, poker, craps and slot machines are offered for our guests’ enjoyment. Located on Deck 6 forward, the Connoisseur Club is the perfect venue to enjoy a fine cigar or imbibe a favorite libation while enjoying spirited conversation with new found friends. This elegant hideaway provides comfortable leather armchairs and a club-like atmosphere. Smoking is permitted in the Connoisseur Club. Located on Decks 5 and 6 forward, the main show lounge is an intimate venue where every seat is the best seat in the house. Perfectly tiered for unobstructed viewing and furnished with plush seating, the phenomenal variety of entertainment here includes full-scale musical productions and rousing cabaret shows backed by our nine-piece Regent Signature Orchestra. Wherever we sail, we take with us the world’s premier spa, Canyon Ranch SpaClub offering an unrivalled approach to health and beauty, with spa services customized for you alone. Enjoy an array of treatments including signature massages and therapeutic bodywork, aromatherapy, ayurvedic and seaweed treatments as well as facials While you’re here, explore our extraordinary selection of luxurious beauty treatments, including hair care, manicures, pedicures and more available in the salon. In addition to planned activities in the Fitness Center, take advantage of other sports-related activities throughout the ship. Deck 12 provides golf cages, shuffleboard, paddle tennis and a full-circle jogging track. Eleven laps around the Jogging Track is equal to one mile. It’s easy to stay connected, even while sailing the seven seas. Our ships have WiFi throughout for guests with their own laptops, and there are plenty of computers in the staffed Internet Cafe, which is open round the clock. Printers, e-mails, Internet access and Wireless access throughout the ship are all available for a nominal fee. Our welcoming Reception Desk is open 24 hours a day and our staff is happy to answer your questions and provide any general assistance you may need. The Purser can be contacted at the Reception Desk as well. The Purser can change traveler’s checks and accepts payments of shipboard accounts at the end of the cruise. Postcards and letters can be dropped off here as well and will be delivered to the postal service at the next port of call.